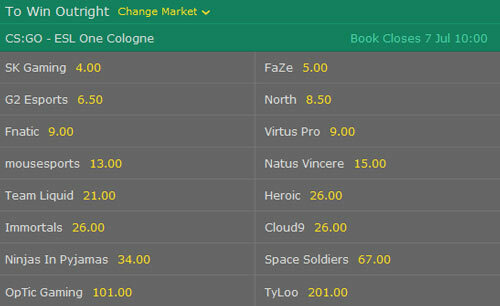 The first bets and odds for the ESL One Cologne 2017 in CS:GO have arrived. With 16 top teams this is shaping up to be an exciting tournament with a prizepool of $250,000. Most of the teams were directly invited and there were only 4 spots for teams from the qualifications. Now every participating team is known and the tournament roster filled. 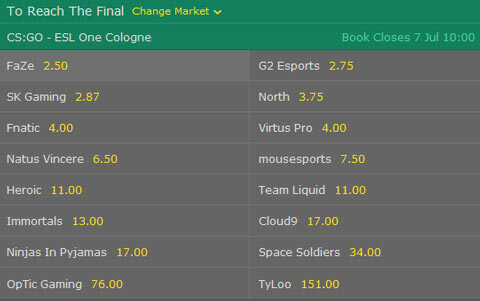 At the same time bet365, as the first esports betting site, has released different bets with different odds. At the moment there are three kind of bets online. Read on for more information about them. The betting site bet365 has released three different kinds of bets, all of which function along the same lines. For one, there is the bet which team is going to win outright and thus the tournament. Then there is the bet on which region the winning team stems from. And lastly there is the bet about which teams reaches the grand finale. Let's look at them in more detail. If you are unsure how betting on CS:GO works at all, please read here. Most likely the best known bet: Here you place your bet on the team which you think is going to win the tournament. Of course there are favorites in FaZe, G2 and SK Gaming according to the betting site. But still, in a LAN setting in which the ESL One Cologne is played everything is possible and so an underdog might end up winning. It functions exactly like the first bet, only in this you bet on the region from which the winning team stems from. And with only three regions in Europe, NA and China participating, this bet is a lot easier to call than the first. Europe is the clear favorite with NA following closely behind. With only one participating team being from China, they are the clear underdogs here. For this bet only reaching the grand finals is important, it doesn't really matter who wins in the end. You can bet on up to two teams who you think are going to play against each other in the finale. This gives the opportunity to win twice. You can also bet on only one team, but then you have to hope it will reach the final.